Leigh’s artistic work builds a number of bridges, firstly his work helps close the gap between art and science, secondly it gives the normal person a glimpse into an autistic person’s way of seeing, and thirdly it helps us envisage the unseen dimensions of the universe. Leigh Arnold sees, or at least visualizes form and structure, in a way that most others cannot. Geoff Wyvill has suggested; “It appears 96% of people cannot even find the corners of an imaginary cube standing on a corner”. I’ll hazard a guess that the way Leigh sees 3D structure would be less than the ability of 1% of the population. He is severely dyslexic and mildly autistic, however, it wasn’t until he was around forty five years of age that he was correctly diagnosed, prior to this his day to day life was very difficult. 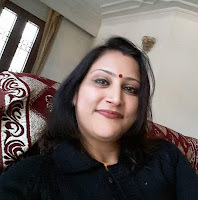 It is almost unimaginable to those of us that can read numbers and letters in their correct sequence to appreciate the problems dyslexics have in giving out their correct phone number or reading their own bank statement properly. The upside of the situation is the special way of seeing, which if channelled into visual art, enriches all our lives. The images accompanying this short article are a tiny sample of the prolific output of this amazing artist. From his earliest childhood Leigh remembers analysing and working out the complex structure of the patterns in his grandmother’s Persian rugs. This has led to a fascination with pattern and symmetry, together with an exploration of the mathematics behind these phenomena. 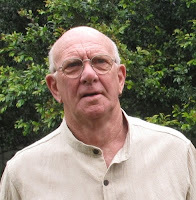 Writing is very difficult for Leigh; however, he has taught himself to read by association and reads mathematics, geometry and quantum physics books like others read fiction. 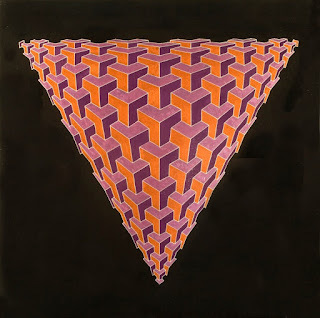 The main impetus behind Leigh’s artistic adventures is to show the basic structure behind the various forms of symmetry evident in nature, mathematics and its representation in quantum notions of reality. His images often have mathematical grids with almost bizarre tessellations and repetition of structural elements. Also investigation of such formal theories as Ramsey Theory provides inspiration for Leigh. He doesn’t necessarily use equations or formulae to construct his works, but more employs the concept behind the theories as a basis for construction. Ramsey Theory is a branch of mathematics which investigates the condition under which order must appear. As the saying goes, “complete disorder is impossible”. Leigh takes a simple object, say a cube, and by use of perspective and importantly, colour manipulation, of which he is master, creates a world which displays precise order in incredible complexity. People often comment that his work is like Escher’s, there are of course similarities but also major differences. With the exception of his Mayan and other calendar system paintings, all Leigh’s work is 3D. 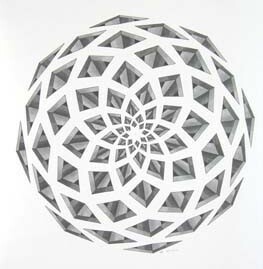 Much of Escher’s work consists of 2D pattern studies. The other main difference is Leigh doesn’t use birds, fish and so on as the main structural elements in his compositions. 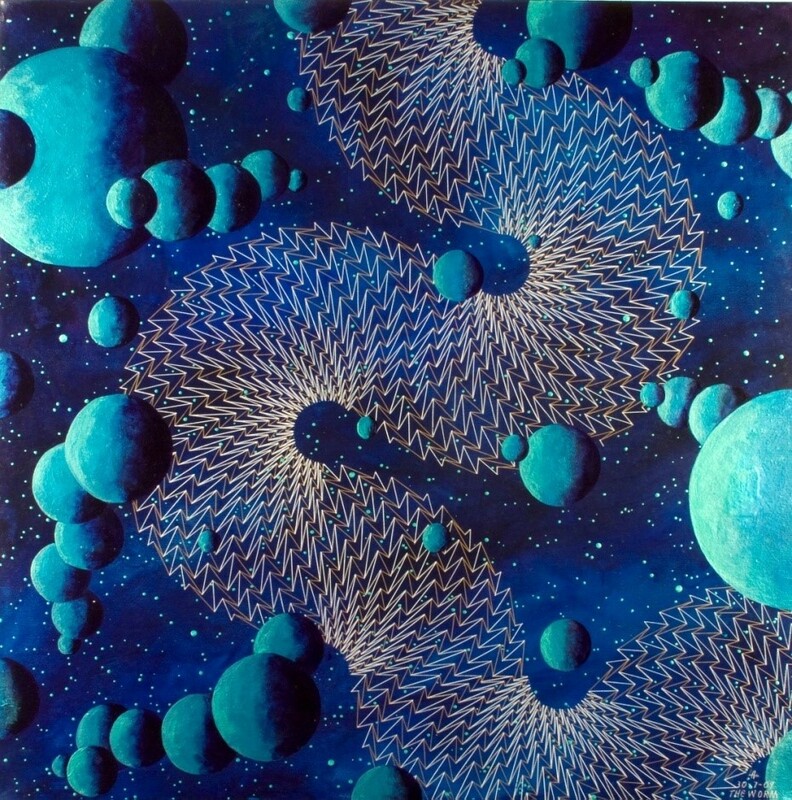 Many of his major paintings have a background of outer space – star fields, spiral nebulae and planets - floating towards central vortices, these take his images from mere graphic illustration to works of fine art. 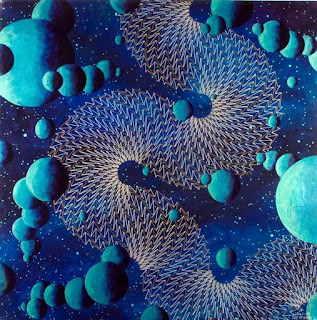 Leigh’s work has recently gained another dimension (pun intended) through his clever manipulation of colour and supplying the viewer with stereoscopic glasses, the main elements in his paintings, such as planets, literally float in front of the viewer in a surreal hyperspace. It is worth mentioning that all Leigh’s works are hand painted in mixed media and have no input from computers whatsoever. 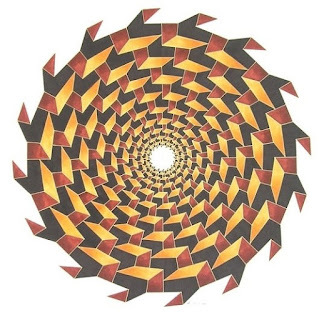 Leigh’s smaller works such as “Spiral Escalator” (Fig. 1) are painted on illustration board using mainly coloured inks. 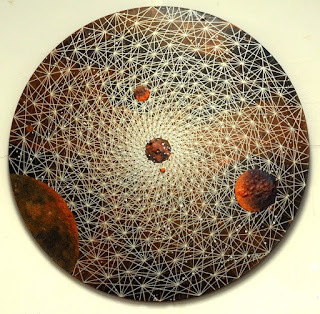 The larger works are painted on artist’s hardboard using a variety of artist- quality mixed media, including reflective paints to highlight sections of the structure, this has the effect of emphasising the symmetry or tessellation of the composition. His images work equally well on two levels. Firstly, the dramatic impact of the initial viewing, which in the case of most of his images never seems to diminish. Secondly, on closer detailed inspection elements that were not obvious at first glance reveal themselves almost uncannily. As an example, in Fig. 2 “Central Support Column Study”, where the four spokes join at the hub this is supported within the spherical form by columns growing outwards from the centre. Further, the “surface” elements of the sphere actually grow out of the off-white background, as though they are coming into existence from a background potential. In Fig. 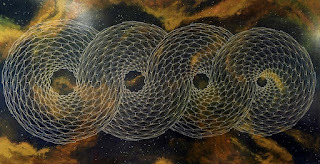 3, “Endless Creation”, careful study reveals the toroidal shape growing larger from right to left, yet it eternally turns back on itself so as to recreate itself. The size of the painting ground (2 metres) limited the number of repetitions. I can imagine how stunning this work would look in the large foyer of an office building, perhaps ten metres (33 feet) in length. 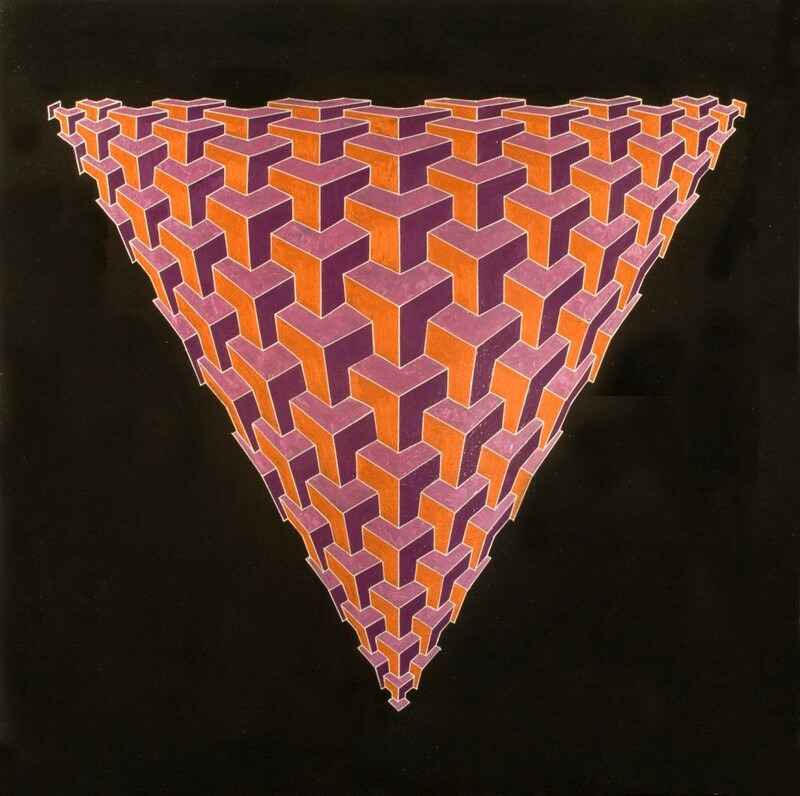 Even if most of us can’t visualize mathematical structure as Leigh does, using the process of gently staring at an image will reveal many of the geometrical illusions such as in Fig. 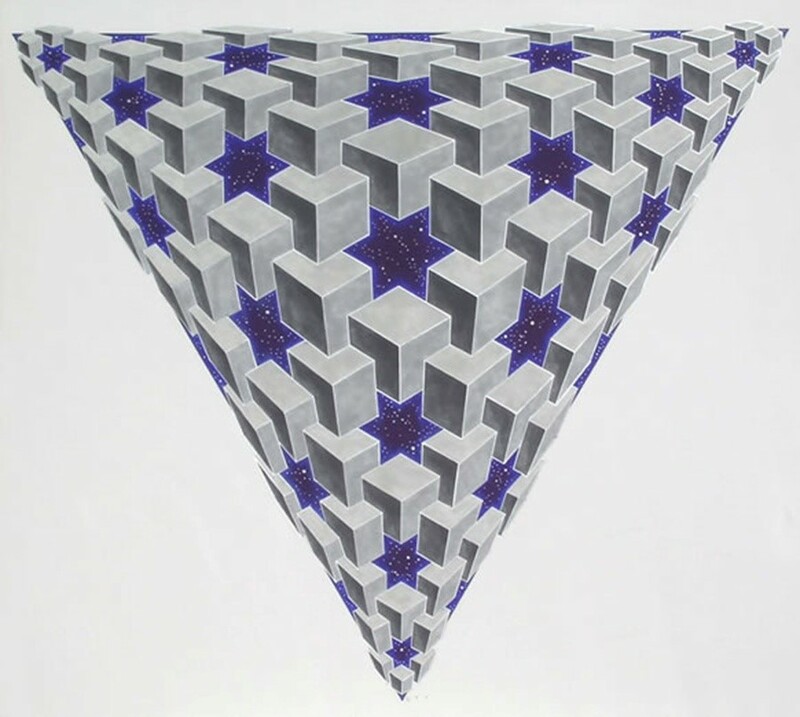 5 “Cube-Star Illusion”. At first you may not see the blue stars, just the cube shapes, but after a while all you can see is blue stars then of course it starts oscillating back and forth between the two. It’s almost like an animation with our brain providing the movement between the structural elements. Fig. 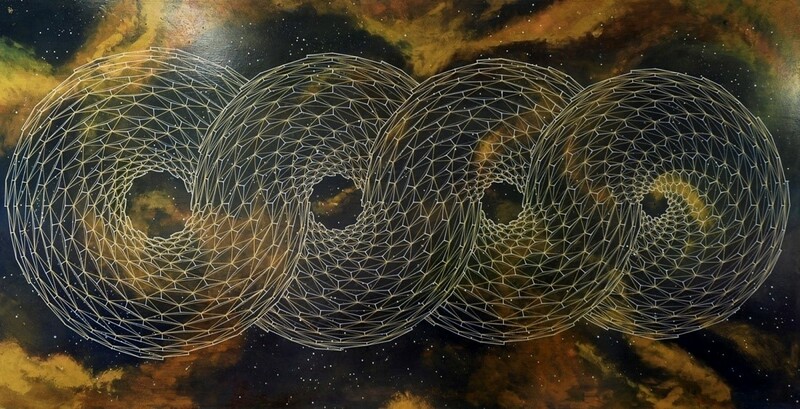 6, “Stargate” does not, as a small printed image, convey the power and beauty of the full size painting. 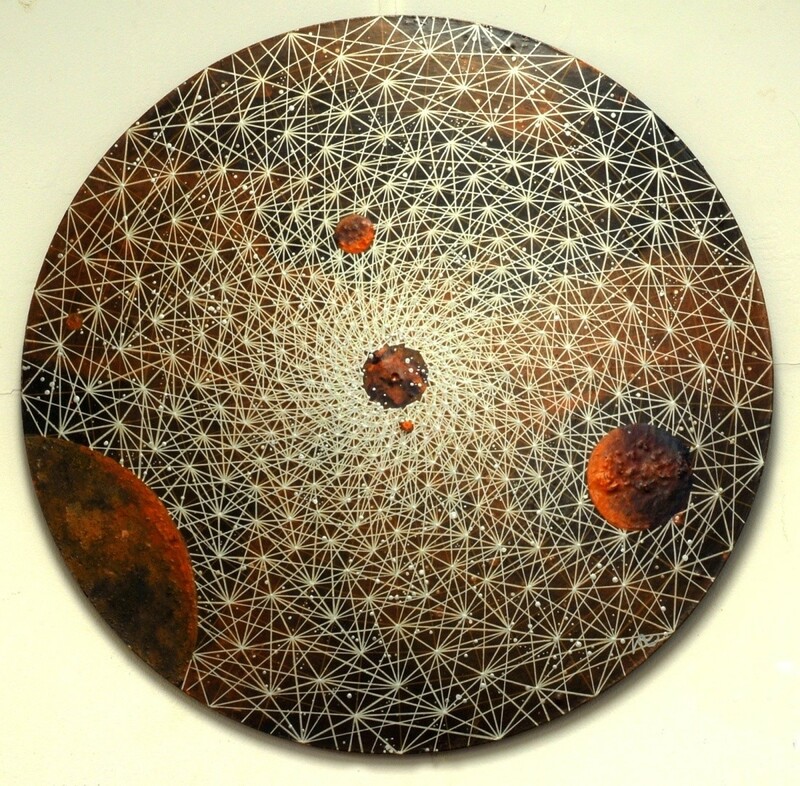 I first saw this image at one of Leigh’s solo exhibitions and was quite overwhelmed by the hypnotic effect, which makes one feel like one is being drawn into the centre of the vortex along with the planets. Leigh has recently moved to Lismore, prior to this he lived and worked in a rainforest setting near Nimbin in northern NSW, Australia. 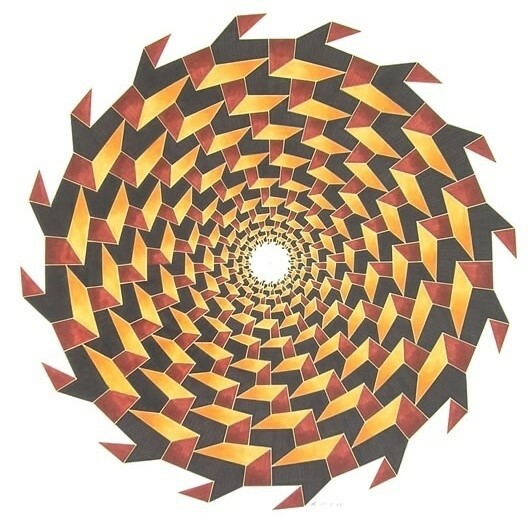 Recently the Australian Mathematical Science Institute, through the University of Melbourne commissioned separately, two of his images for the logos and promotional materials for their mathematical conferences. The first one was “Symmetries & Stabilities” and the current one “Concepts of Entropy & Their Applications”. For those interested in enjoying more of Leigh’s work please visit or contact the Nimbin Artist’s Gallery, Nimbin +61 0266891444 or you may email Robert.